I LOVE your sauces. My hubby and I pretty much put them on everything. Every meal deserves some of that love!!! Keiko and I were just talking this morning over brekkies about how we love what you and your wife do and how you are in it for the love of it and nothing more. We support people like you 100x over!! So thank you for being awesome! And creative. And just going for it. We love cooking and having people over and your sauces are always for people to use. We have a wood fired oven and cook some amazing pizzas in it. Your sauces just add such great flavor and the perfect amount of heat. Love it. People are always impressed. I got the Hamajang…love it! I’m seriously addicted to your hot sauces. I carry them in my purse, no joke! Just came back from a week of beach holiday in Maui where we stayed at Andaz and discovered your delicious and wonderful hot sauces!!! We will be heading home soon and back to Melbourne, Australia. I managed to purchase some of your sauces from Honolulu Gourmet in Waikiki. Can’t wait for some of our relatives and friends to try them out. First of all, we would like to say that my girlfriend and I are big fans of your products. We found out about you on instagram a couple time ago and we even ordered some hot sauce down here in northern Quebec (Canada). We use it with everything! Eve C-M & Olivier P.
I just got introduced to you yesterday (gift from a friend)! Your sauces are AMAZING! I’m hooked!!! I quickly came to see what other ones I can try out. 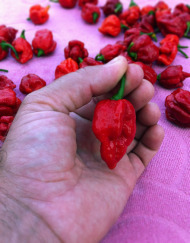 Unfortunately, it looks like you’re out of the MAUI NO KA OI – TRINIDAD MORUGA SCORPION & the HAWAIIAN??? Does this mean I’m out of luck till next season? We recently moved to Palm Springs California from Oahu and could not find the Bangkok sauce anywhere. I ordered 3 bottles online but we got the wrong order. We got Bangkok, Hamajang, and the Pineapple. I called to report the error and was told to share the other sauces with friends and the correct order will be sent out. Wow!!! How wonderful and what GREAT customer service. I just wanted to thank you and hopefully your sauces will be sold in a store in our area. Hope all is going well. I backed your kickstarter at the level where I got one of each flavor. I don’t really know how to say this. I have a fairly compulsive hot sauce buying habit. I have around 40 between my cupboard and my refrigerator. Yours are my favorite. And when I say yours I mean every flavor. Perfect balance of heat and flavor. I’ve never had a habanero hot sauce that brought out the great flavors of habanero with a decent amount of heat but not obscenely hot. I find most jalapeno hot sauces really dull, but not yours. And the other ones are unique blends and each one is right at that tipping point between flavor and heat that I think most hot sauces aim for but rarely hit. Good work. I look forward to following up and hopefully ordering more someday. Was just in Maui for 11 days and fell in love with your hot sauces. They had it on the tables at Cafe Mambo in Paia and then on sale at the gift shops at the Westin Ka’anapali Villas. Bought two bottles for home and I’m excited to get 3 more. I just returned from Kihei, in the (5) days I was in Maui we spent (3) of our breakfasts @ the Kihei Cafe competitive eating (sort of, really we just ate like we had never seen food before). Your Hamajang is AWESOME. I make habanero pineapple jam, and your stuff blows doors off mine. Too bad I was a super idiot and forgot to check my bag, the guy tossed my bottles and I insisted he keep them b/c the sauce is awesome. I made sure he let me look @ the back of the bottle so I could order more. So glad you ship! Thank you. We love our Adoboloco. I add it to our popcorn, salads and pretty much everything. Way to go Adoboloco. You make GREAT sauce. I haven’t tried all of them yet, but so far my favorite is the Hamajang. It has an amazing smoky flavor. Thanks for working with us! You’re hot sauce was a big hit in the office — our desk pod has been slathering it on our breakfast sandwiches. Post by Ronnie J. Page.